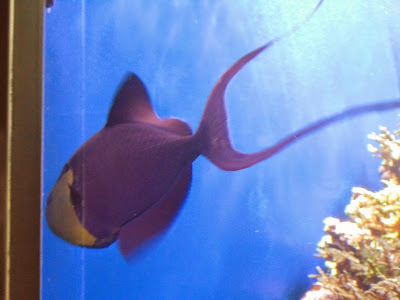 I love aquariums and I tend to like the more unusual fish that are swimming in the tanks. Unfortunately the indoor darkened lighting and the fast moving fish tend to make photographs a challenge. I found this purple fish with the yellowish head and a beautiful giant tail swimming in on the tanks and followed it around with my camera. This is the best shot I managed to get. The tank display information didn’t seem to have a picture corresponding to this so I’m not sure what kind of fish it is but maybe one of you can help identify this. One of the star attractions at the Waikiki Aquariums are the two Hawaii Monk Seals. This one is Ho’ailona (also known by as KP2). He was abandoned by his mother on Kauai when he was a few days old and taken in by NOAA, who hoped to return him to the wild one day. He was released back into the wild in December 2008 about 7 months later. In the fall of 2009 it was evident he was not acclimating well tot he wild and interacting with humans. NOAA brought him in again and discovered cataracts in both eyes impaired his vision. 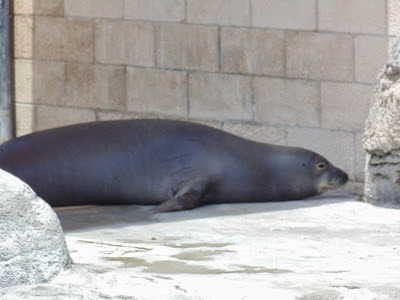 It was decided his chance in the wild were not good so he was kept at the University of California Santa Cruz and in November 2011 moved to the Waikiki Aquarium were you can see him and their other monk seal Maka’Onanoa and learn more about these critically endangered species. Only around 1,100 remain in the wild and it is hoped information learned from these monk seals could help with future recovery efforts for the population. One of my favorite exhibits at the Waikiki Aquarium (or for that matter any aquarium) are the Jellyfish. I wouldn’t want to encounter these while swimming in the ocean but its just amazing to watch them floating and swimming the aquariums. This photo is of the Lagoon Jellyfish and is one of the best jellyfish photos I have ever taken. The dark lights and the constant motion makes getting a good photo a challenge though I could just sit there for a long time staring at the graceful movement of the jellyfish. 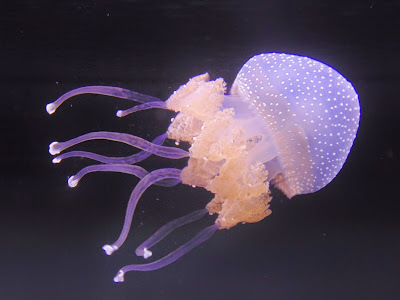 To get an idea check out my Lagoon Jellyfish and Moon Jellyfish you tube videos.